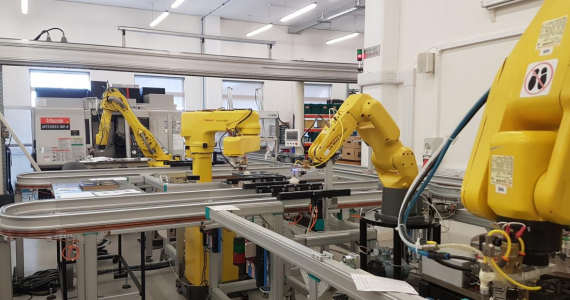 The automation and control research theme aims to develop and implement solutions to enable manufacturing systems to cope and manage disruptions. The state of the art automation lab provides a flexible and reconfigurable environment to implement and test various smart disruption management solutions. The automation lab is equipped with various manufacturing technologies with different direct part marking technologies enabling the development of advanced solutions for next generation manufacturing systems. We also work on developing tracking systems for manufacturing operations by employing various technologies such as RFID and ink-jet printing. The control and tracking architecture then utilises these technologies to track and control operations. The research group was one of the first to propose the concept of intelligent products, where we combine the uniquely identified individual product with information such as process parameter, quality, state and location. This then allows the development of distributed control system to make smart intelligent decisions dynamically. Additionally, capture of various information allows us to develop data driven solutions based on analytics. The advancements in new manufacturing technologies require further investigation for integration with conventional manufacturing systems. For instance, we are exploring novel ways to integrate 3D printing with conventional manufacturing systems and are developing control architecture for such distributed manufacturing systems. Furthermore, the need for personalised, fully customised products creates unique challenges in developing control solutions. We are investigating the control requirements for mass customisation and the technological solutions associated with it. Automation Audit: This tool allows organisations to assess the potential benefits of employing automation solutions for manufacturing applications. Production Disruption Audit: This tool allows manufacturing organisations to determine the type and impact of disruptions in their operations, and determines the response capability to those disruptions. This tool permits organisations to identify and act on vulnerabilities in the production system.